James Dumville (b 1837) was the first child of Thomas Dumville (c1800-1890) and Janet Dumville née Jardine (b c1807), and a grandson of James Dumville (b c1776). 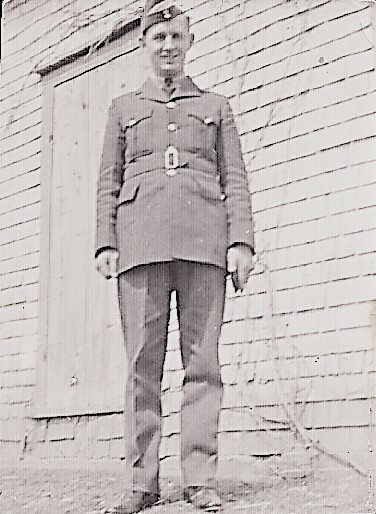 Sergeant Allister George Dumville, Royal Canadian Air Force, was born on 28th November 1915 in Oak Point, Bonaventure County, Quebec. On 30th July 1941 he married Leona Irene Forrest, a registered nurse attached to Miramichi Hospital in Newcastle, New Brunswick. Allister died during the Second World War on 3rd November 1941, at the age of 25, when the Hawker Hurricane he was flying came down near Pelton Fell, which is near Chester-le-Street in County Durham. He is buried in the Hylton (Castletown) Cemetery in Sunderland. The residents of Pelton Fell are replanting a memorial wood, known as The Forty Trees, to restore the number of trees to forty. They discovered that Sergeant Dumville's Hawker Hurricane came down near The Forty Trees, and are planning to include him on the memorial wood plaque. The photograph on the left of Sergeant Allister Dumville shows him before he was awarded his rank markings and his wings. This photograph was very kindly provided by Daniel Keays, who is a grand-nephew of Allister Dumville and who sent a message to the Guest Book on 14 February 2018. The photograph on the right of Sergeant Allister Dumville and the information about Pelton Fell and the Hylton (Castletown) Cemetery were very kindly provided by Janice Bertram, whose family originate from Pelton Fell and who sent a message to the Guest Book on 21 March 2017. Most of the information on this page was copied from a book by Clifford Dumville, 'The Dumvilles of Prince Edward Island, Restigouche County, New Brunswick, and The Gaspe, Quebec'. Additional information was very kindly provided by Daniel Keays.